One of the biggest barriers to anyone starting off in the world of video editing is the often confusing or indecipherable technicals terms that get bandied about all over the place. The industry itself has an atrocious record for failing to define its own terms or for defining them in a way that is well… indefinable! Sometimes the terms themselves give a little insight into what they could possibly mean but more often than not they just don’t. One of the first ones that most people hit that they are aware of is the act of saving a project. In just about every software application you can think of, if you open it up, start whatever it is you are doing then hit “save,” whatever it is you were doing gets saved. Right? Open a Word document, type some stuff, save it and when you open it again what you typed is there. Now if you type something else or make changes and hit “Save” again the document changes. Unfortunately, in video editing software this simply does not happen. The reason for this is that in video editing the process is “non-destructive” meaning that the original images, video files and audio files are never, ever touched by the program in any way. Exactly what is it that we are saving when we want to do that? There are two possibilities here, we either want to “save” the project we are working on so we can come back to it later or we want to actually execute all our editing decisions and create the project as a video file. So in editing software, it is handled like this. If you want to save your work so far so that you can return to it later you hit “Save” and your project is saved as a project file. If you have completed everything you want to do and want the final file created you choose Export or Render or a similar term meaning to create the final file. The really weird part of all this is that everything I have outlined here is the accepted practice for non-destructive editing. So what do we call non-destructive editing? Nonlinear Editing of course or NLE! To sort that out check the video below. With most people shooting in high definition these days the subject of stabilization increases in importance. I often have people asking about “in editor” stabilization modules or features and although these have come a long way there is one surefire way to make sure your shots are stable. That system, of course, is a tripod. Ya gets what ya pays for. There are however bargains to be had out there on the interwebs but before you go off shopping by price it is probably a good idea to get down to what features you should be looking for in a good tripod. 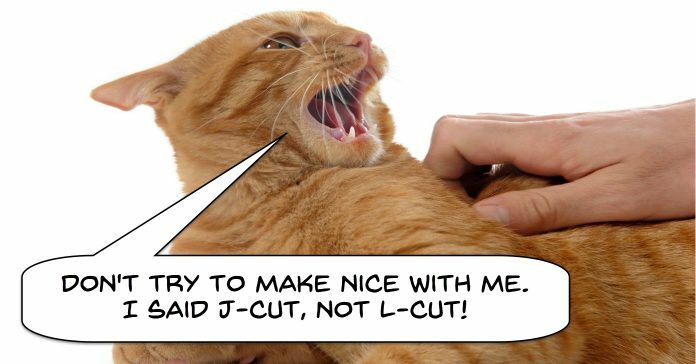 One of the easiest ways to get a professional feel to your videos is to incorporate either J-cuts or L-cuts to your projects. So first up let’s establish what they are and why they have such an effect. Let’s imagine we have two clips on the timeline. When we cut from clip number one to clip number two we have the audio from clip number one continue past the point of the visual cut or change. That one is called the L-cut. A J-cut is the opposite where the audio of the second clip begins before the visual change to that clip occurs. Obviously in executing these type of cuts, we have to have the audio separated out from the video clips they come from. So to reiterate, in an L-cut the visual changes to the next shot but the audio from the first shot continues and in the J-cut the audio changes before the visual cut to the next shot. So the question is what is the big deal with J-cuts and L-cuts? Basically, it comes down to art imitating life. In real life, the visual information you are receiving on a constant basis does not exactly match in timing, the audible information you are receiving or information you are receiving through other senses. In a conversation with two other people, your eyesight does not fall on to the person talking at the exact moment they begin to talk and when the other person talks you don’t instantly snap to them. More often than not there is a lag between audible events and visual events. J-cuts and L-cut imitate this more natural scenario and with a little work (not too much!) they can lift your projects to a much higher level. The article linked below goes a little more into the why’s of it all but more importantly gives how to do it, when to do it and provides lots of video examples. This is just a quick video on the available keyboard shortcuts for DaVinci Resolve. Obviously I am adding it this week because it is a handy reference but I also wanted to add a bit of a blurb on shortcuts in general. Very often people get started in video editing and they are to some degree lured into it by both the need to deal with available video and the marketing guff that assures them it is simply a matter pointing, clicking and dragging their way to Hollywood magic! Like most relationships, it all starts out with romantic dinner dates, flowers and chocolates but eventually the realities of life set in. This is especially true when it comes to using some of the more advanced features many editing programs offer today. Take for example motion masks. It all seems pretty straightforward and most editors even have an automatic system for tracking as the video progresses. It all seems pretty straightforward and most editors even have an automatic system for tracking as the video progresses. However it usually doesn’t take long before the software loses track of what you are masking and you have to stop and correct. And then you stop and correct, and stop and correct, and stop and correct on and on for what seems like hours… probably because it actually has taken hours! However all is not lost because although the professionals have to do pretty much the same thing there is one weapon they use that you can use too. That weapon is keyboard shortcuts. Now before you even think that your editor does not have them, think again because they ALL have them, it’s just that you haven’t found them yet! Eventually in your progress as an editor, amateur or otherwise you will notice that there are tasks or movements that you are repeating over and over. The most inefficient way to carry them out is by pointing and clicking with a mouse. All you have to do is read the “Help” section of whatever program you are using and find the keyboard shortcut for that action. Learn it, use it and be amazed at how much better your life will become. If you find you are doing something repetitively and there is no keyboard shortcut for that action just go back to the manual and there will be a section on how to create a custom one for yourself. If you really want to get fancy you can re-map all the shortcuts available to the keys you choose. Just a tip on this one, map the shortcuts to keys on the left side of the keyboard so you use your left hand for shortcuts and your right hand for the mouse. Have you ever been watching a movie and during a particularly intense scene you get a feeling of increasing anxiety or a sense that somehow tension just keeps building and building? Well the way filmmakers do that has to obviously include the shots being presented and the storyline but, there is very often something else at play. That “something else” is a special kind of sound effect called the Shepard Tone. Basically it is a sound created from high, mid and low frequencies on the basis of a loop. However the way the frequencies are arranged is so that each frequency rises then loops back to the lower beginning at different times. The result of this is a sound illusion that makes the overall audio sound like it is infinitely rising and as such adds to the building tension. Linked below is a good article on the subject with some great examples and another link to a Shepard Tone generator you can play with. Linked below is a good article on the subject with some great examples and another link to a Shepard Tone generator you can play with.